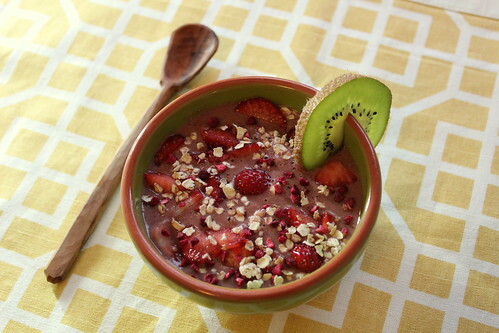 Today my good friend Emily of sunroseclear.com is guest-posting on the chia pudding food craze. On Emily’s last visit (Imbolc 2015! ), I gave her some top quality chia seeds from Naturya and sent her on a mission to experiment with chia pudding and report back on her results. Is it really worth all the hype? For my first chia pudding I looked to Choosing Raw for a basic recipe and used her 3 tbsp chia : 1 cup liquid as my pudding standard. For me this made enough for breakfast and an afternoon snack. Chia pudding is filling! I found the basic chia, almond milk, vanilla, and honey pretty boring, even with blueberries on top. The texture is like tapioca pudding, which is not my favorite thing…but eventually I convinced myself they’re like the world’s smallest tea bubbles. That helped, but…onward! Just mix it all up in a glass or jar and let it set for about 3 hours or overnight. I really squeezed the tea bag into my glass – and then used it again for tea! Sadly, while pretty, the orange marmalade garnish was too overwhelming a flavor. As Monica has pointed out in her ingenious smoothie book (which I use all the time, seriously, she isn’t making me say this), bananas are a great smoothie thickener but also kind of a sugar bomb. Most of my daily smoothies still have a smidge of banana, but for a week I tried replacing it with chia. It definitely does the trick, especially if you let the smoothie sit for a few minutes. This is probably how I will use chia most often. More protein, calcium, and fiber for me! I know I’m not the first to think of it, but making a chia pudding using a smoothie as your liquid is pretty great. It completely replaced the simple pudding of my affections. You still get the tapioca texture from the chia, but with lots of healthy fruit and veg – and no additional sweeteners. That said, it also has dessert potential. 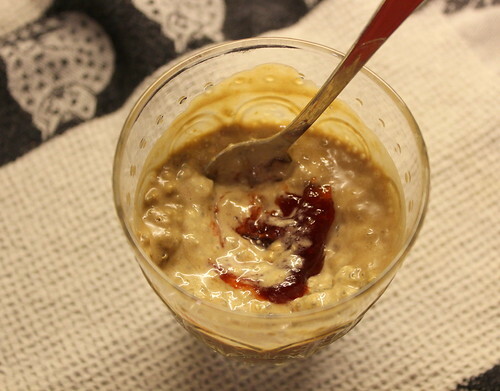 I made a Peanut Butter and Jelly Chia Pudding from a peanut butter, banana, oatmeal, and almond milk smoothie. Chill for a few hours and swirl some strawberry jam through. A nice dessert version of the sandwich classic. 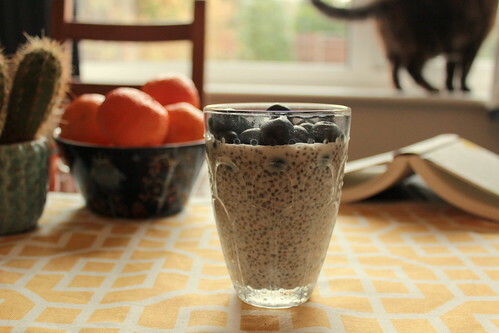 Verdict: I’ll certainly keep adding chia to my morning smoothies for the nutrition boost and possibly explore some other chia desserts. Monica’s Notes on Nutrition: I felt compelled to add some commentary on the nutritional value of Chia Pudding. As an example, a chia pudding made with 3 Tbsp chia, 1 cup of unsweetened almond milk, 2 tsp honey and 1/2 cup of blueberries has 333 Calories, 19g fat, 18g fiber, 42g carbs and 11g Protein. Compare this to, say, 50g of porridge with the same amount of almond milk, honey and blueberries: 308 Calories, 7.5g fat, 8g fiber, 58g carbs, 7.8g Protein. 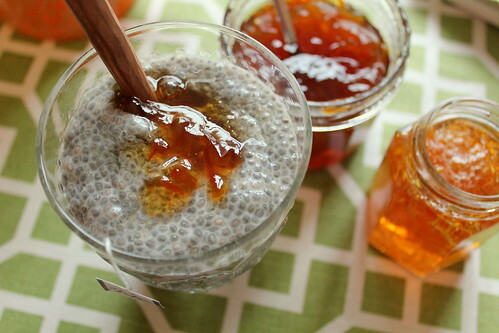 Those who are fat-phobic might scoff at the chia pudding, where ~50% of the calories come from fat. Chia has been praised as being a concentrated source of omega-3 fatty acids, but research shows that the body isn’t very good at converting these types of plant-based omega-3s into something the body can be used. Still, they are a source of fibre, protein, vitamins and minerals so they’re not going to do you any harm. I like how Katie Trant (nutritionist and author of the Muffin Myth blog) puts it in her well-researched article Chia Seeds: Healthy or Hype? – “Chia seeds are without question very healthy, but they’re not a miracle.” And probably not even life-changing. Follow Emily’s chia antics – among other things – on Instagram, Twitter and her blog. 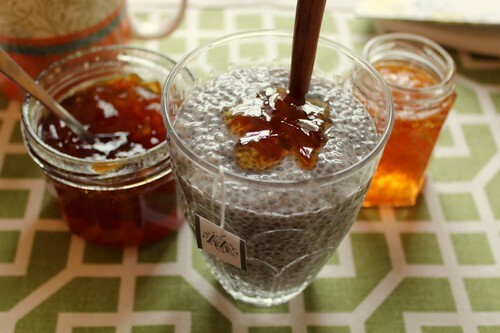 And look out for more chia experiments to come: chia trifles, chia parfaits, chia jam… what else? Share your chia inspiration in the comments! Kellie – glad you enjoyed the article and I am eager to see what you do with the Earl Grey tea recipe. Thanks also for the heads up on Oh My Veggies – I’ve corrected the copy to credit Katie Trant. Today I am doing the Early Grey version. This one stuck in my mind and I have now been prompted to actually do it as part of the #eatthelarder challenge. Lots of chia seeds waiting to be creatively incorporated into our day.